his is an amazingly gorgeous Victorian Duster. I wish this fit me because I would wear it in a heartbeat! The neckline has a rounded 1-1/4" high collar. 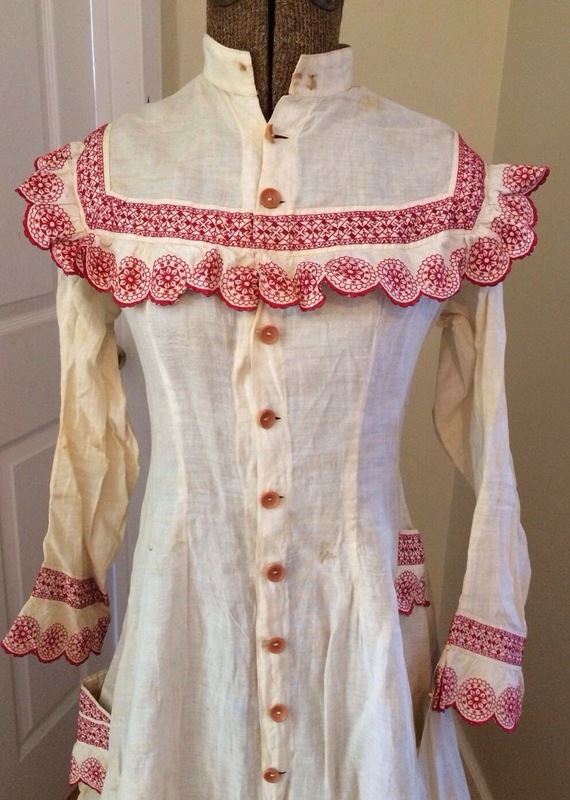 The sleeves are long and have embroidered trim around cuff and an embroidered scalloped edge ruffle. The embroidered trim is also present on bodice along shoulder and across chest and back. Red piping at armholes. One small pocket detail on left side just below waist, another larger pocket closer to hip level on right with a very interesting shape and gathers.. 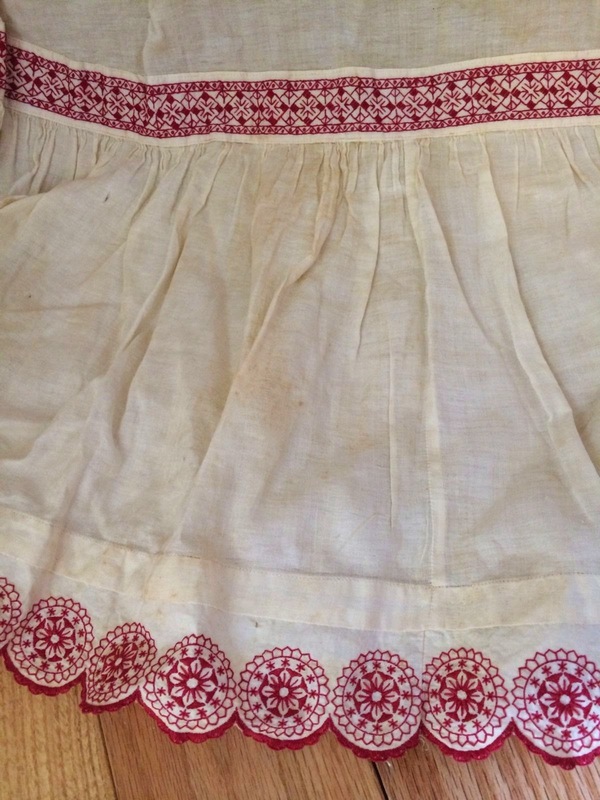 There is a 12" ruffle at bottom of skirt which has the red embroidered trim with scalloped edge. 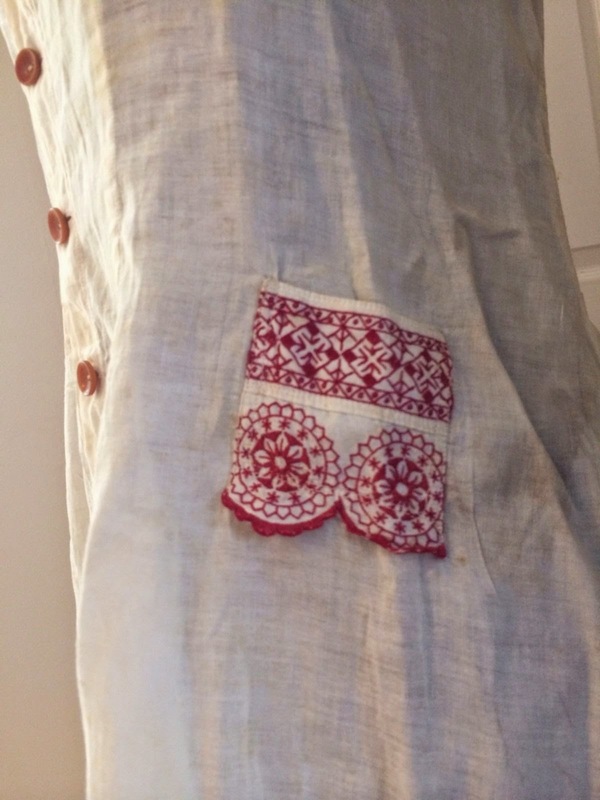 The garment has 15 button opening (2 are cracked/missing) down front and one tiny mother of pearl button where trim crosses closure. The back has a center panel with inverted pleating on either side. 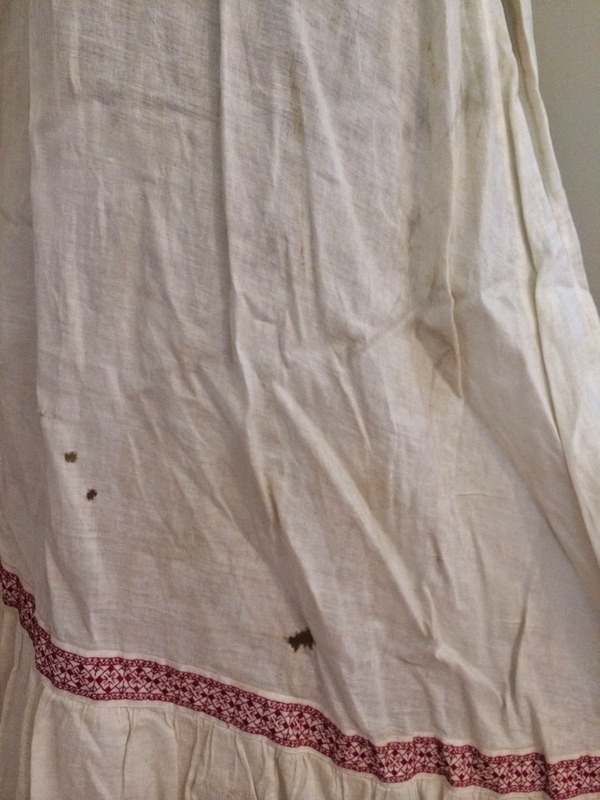 There is discoloration at collar opening in front and light discoloration throughout, roughly five 1/8" holes in skirt, four 1/8" or smaller tears, roughly four 1/4" holes in skirt, one 1/2", and one 1/2" hole in skirt. There are also a handful of scattered tiny holes in ruffle and skirt underneath ruffle toward hem. There is one 1/2" ear on right sleeve and a 1" by 1" L shaped tear in same sleeve. Bust 36" Waist 26" Hip 46" Waist to hem in front 45" to hem in back 52" Back from midway down armhole to same on other side roughly 11-1/2"-12" Armhole roughly 14" Sleeve roughly 20" Circumference of hem 132". Please see photos. ...No idea why the seller thinks this is a coat (duster). 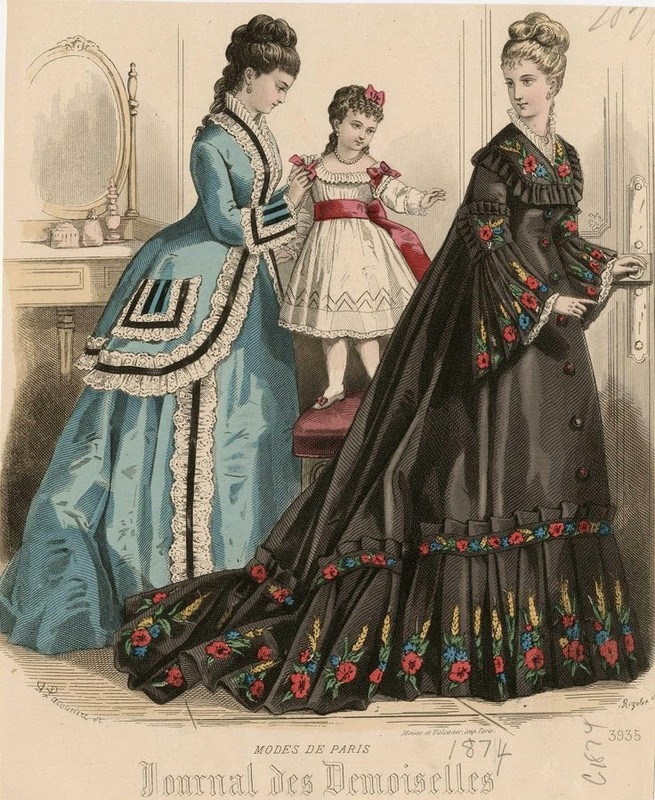 Although the sleeves are different, the trim placement and the styling of the back are very similar to the black dress in the fashion plate above. 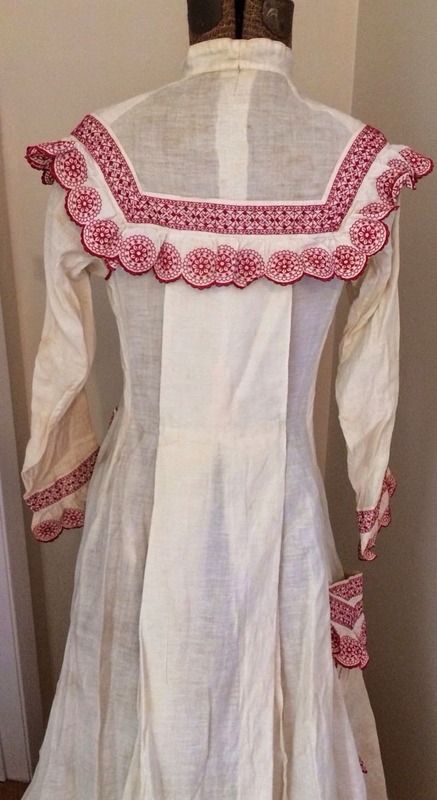 I adore this extant dress. 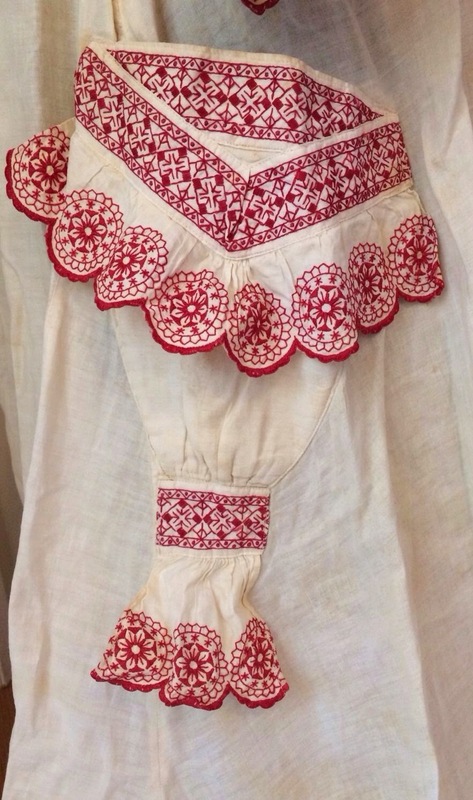 It's simple but the red embroidered trim and the red piping make it look special. I've shared the fashion print you have here with my friends on Facebook and we're discussing it. 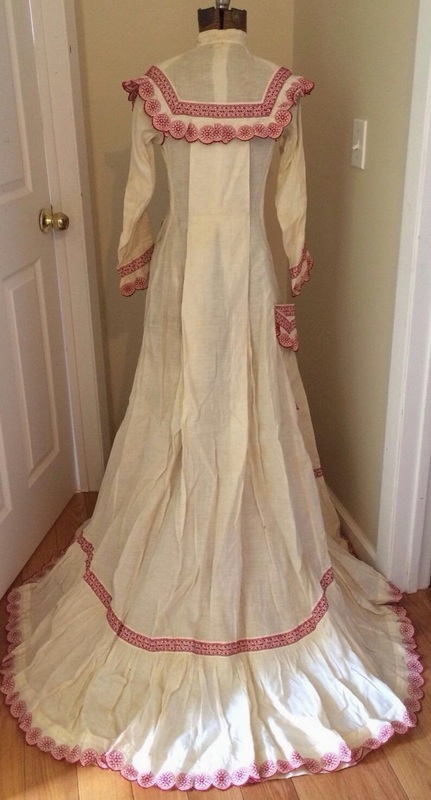 Most are saying a tea gown, something worn in the home. 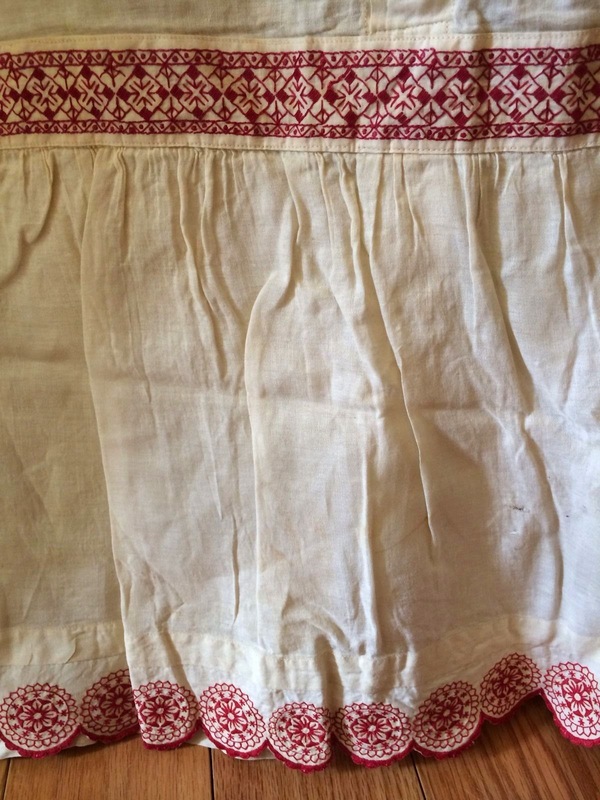 Truly Victorian has a pattern similar to it but not as full a skirt. I honestly think it's a wrapper - which seems to have been worn outside of the house on occasion. 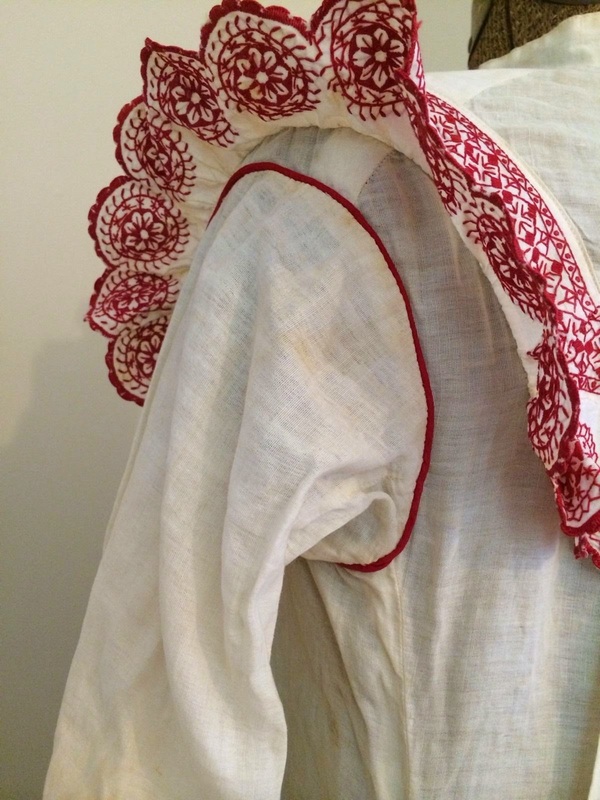 The Watteau back was fashionable in the mid 1870's due to the 18th century influences.